At the heart of a Christian community is the care and nurturing of one another and the welcoming of strangers and visitors through fellowship and care. St. Peter’s Pastoral Care Committee’s mission is to serve parishioners through activities and prayers when they are ill, disabled or in need of personal support and attention from their parish family. The committee, which includes the Rector, meets monthly to confidentially discuss ways to address parishioner needs. We are especially focused on members who are unable to attend church or who have had an illness or surgery. We plan home visits and phone calls and coordinate with our priest, deacon, and lay ministers for home communions. As needed from time to time we arrange for transportation, home delivered meals, and respite care. Two components of Pastoral Care are the Flower Ministry and the Prayer Circle. During Advent and Lent we send winter greens or a small olive wood cross with a purple ribbon. The Prayer Circle is a group of people who respond in prayer to emailed requests for prayers. These requests are not shared outside this group or published in the Sunday Bulletin. Generally, a member of the prayer circle gathers the concerns or thanksgivings of the person wishing prayers and writes the request in the form of a prayer or in some way communicates the need for the healing transformation of prayer. Persons wishing prayers are asked to contact the church office. 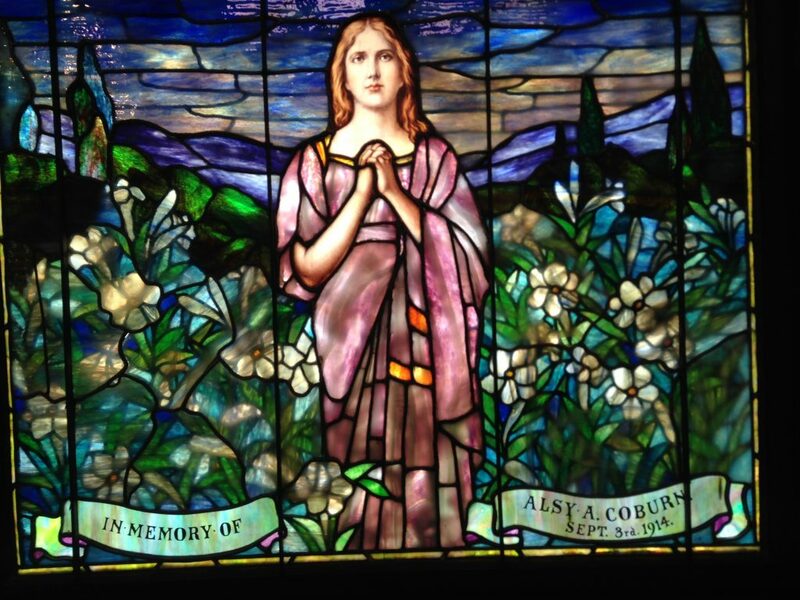 If you feel you have a calling to be part of the Pastoral Care Committee, the Flower Ministry or the Prayer Circle, visit with the Rector who will help you discern your role. One of the first ways people at St. Peter’s say, “Welcome!” to visitors is to give them a small loaf of homemade bread. Our Hospitality Ministry has a team of bread makers who bake a variety of delicious breads for every Sunday. Sealed in a plastic bag, the bread has two tags attached. One tag includes the quote from Scripture, “. . . . I am the bread of life. Whoever comes to me will never be hungry, and whoever believes in me will never be thirsty.” John 6:35. The other tag introduces people to St. Peter’s, giving our Rector’s name, times of service, contact information and inviting people to give their name and contact information so the rector or another parishioner can respond to them. Anyone wishing to join the team of six or more bread makers may contact Marty Rogers. Kneading bread is a lovely, quiet time for mediation and prayer. We also share delicious recipes. Each Sunday, a simple coffee hour follows the 8:00 a.m. and 10:30 a.m. worship services. Light snacks, coffee, tea, and juice are provided. Coffee hour is an opportunity to visit with members, newcomers, and strangers and become more familiar with the life of the parish community. It is also an opportunity to mingle with Loaves and Fishes noon lunch program guests who arrive early to enjoy coffee hour fellowship. Volunteers are encouraged to sign up on the form posted on the bulletin board in the Fellowship Hall. 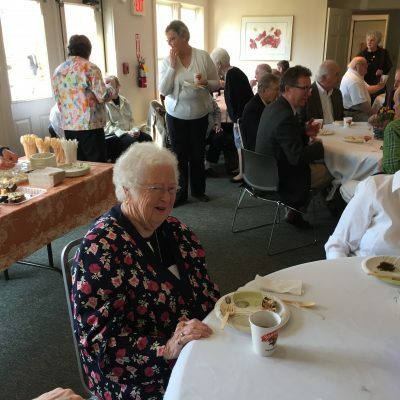 Throughout the year, often following the 10:30 a.m. Sunday service, the Vestry hosts small newcomer lunches in the Parlor so that newcomers can meet the parish leadership, learn one another, and ask questions about St. Peter’s. It also affords an occasion for our leadership teams to become better acquainted with newcomers. Several parish-wide opportunities for fellowship are scheduled each year. Frequently these are pot-luck meals. (St. Peter’s folks like to cook!) 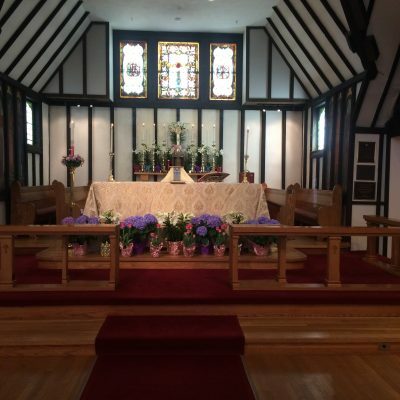 Each Easter a special brunch is scheduled between the 8: 00 and 10:30 services. An early summer cook-out or ice cream social is scheduled for June, and a fall Harvest Dinner grounds our October Stewardship campaign in thanksgiving. 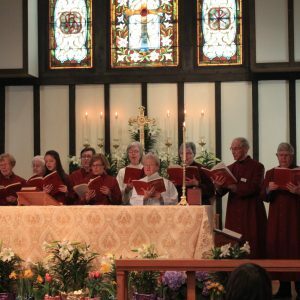 The Episcopal Church Women (ECW) organization is open to all women in the parish. Meetings are held on the First Monday of the month at 1:30 in the afternoon. Meetings, usually at members’ homes, are dedicated to fellowship and events planning. It has been a tradition at St. Peter’s for the ECW to host the Shrove Tuesday Pancake Luncheon for the greater community. ECW also is the primary organizer for funeral or other special receptions. The “donated” funds received from this are designated by ECW for special church or community project needs. Recent beneficiaries include Loaves and Fishes, Meals on Wheels, the Rector’s Discretionary Fund, and the AIO’s Food Pantry. The ECW also sends cards to members of the parish who are ill. ECW heartily welcomes new members. We urge all who are interested to contact the church office to be put in contact with the current president.